Does managing your debts seem like an impossible task? Do you have too many loans and credit cards? Are you simply just juggling your cash to pay the bills and meet your commitments? "You earn it and spend it and there never seems to be anything left over?" Our fuel costs, imports, and recourses have increased - the list goes on. "All these things affect our household budget"
Eureka Lending Group Can Help! By planning your situation we are confident that your life will change. Too much debt can be very stressful. We have assisted hundreds of Ballarat and Melbourne families to restructure their finances saving them hundreds and even thousands of dollars. 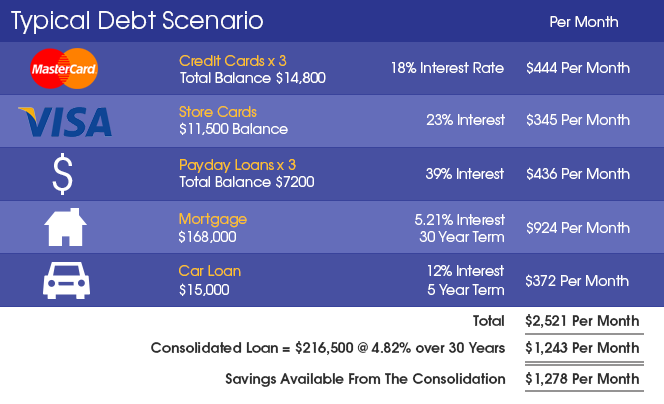 The following chart is an example of a real family who recently restructured their finances. Their circumstances saw one of them retrain themselves to upgrade their qualifications. They used their credit cards and payday loans to fund the training costs. The pressure was high given that they had reduced work hours while training. We put a plan together for them and the outcome was fantastic. They now feel free to manage their finances within their budget and have cash left over to enjoy life. Don't wait until the pressure mounts up. Take action now. Call one of our team today on 1300 797 797 to discuss your situation. We can help you.